A hollow head and exclusive patented AIM & ALIGNMENT TECHNOLOGY are just some of the exciting technological features which make the AT-510 the ultimate Iron on the market for lowering scores and playing more enjoyable golf. 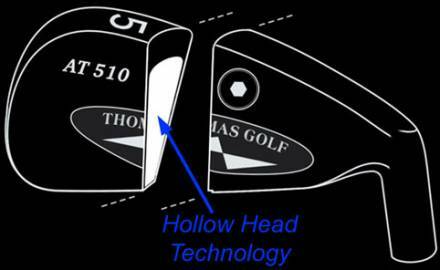 The Thomas Golf Product Development Team challenged itself to create the highest level of Game Improvement Irons, utilizing cutting edge design technology. 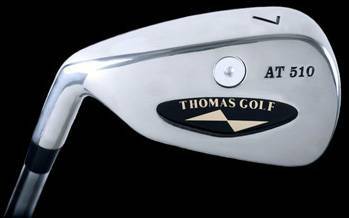 Each iron to also have the patented aim and alignment indicator Thomas Golf is famous for. From this development challenge, the AT-510 Iron was created. The AT-510 is the most Hi-Tech iron Thomas Golf has ever produced, and it delivers unbelievable Game Improvement performance for mid to high handicappers. Thomas Golf Irons give you an exceptional advantage over other brands. The Hollow Head Technology produces unsurpassed forgiveness, easy launch, and maximum playability, while the exclusive patented aiming indicator makes it easier to place your shot right on target. 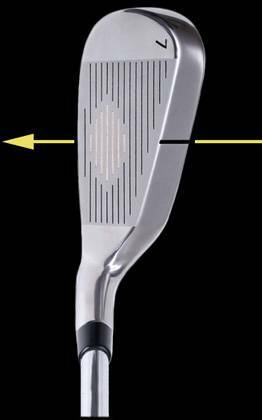 The Hollow Head design completely removes the weight from the center of the club head and dramatically expands the area of forgiveness via enhanced perimeter weighting, and increases the clubhead's MOI (Moment of Inertia) and resistance to twisting during an off-center hit. The AT-510 irons have weight strategically and uniquely distributed in each clubhead of the set. The long irons have weight concentrated low, rearward, and in the heel to facilitate squaring the clubhead and getting the ball airborne. This weight positioning in the long irons creates a high ball flight for long, soft landing shots. As the club numbers increase throughout the set, the AT-510 design incrementally shifts higher and towards the toe to precisely calibrate trajectory and spin rate to prevent shots from ballooning while maintaining the ability to hold greens.